I’ve been planning, prepping, and counting down to this day for the last two months! The leftover furniture graveyard, aka our master bedroom, is finally turning into a proper room. In 5 short weeks, I hope it is unrecognizable in the best possible way. Every Thursday, I’ll be sharing updates on our progress so you can laugh and cry along with me along the way. I don’t really understand how this is possible, but this will be my fourth time taking on the One Room Challenge. 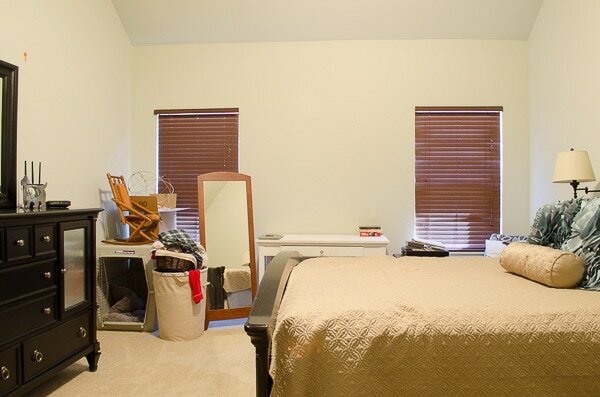 I’m totally hooked on the process of redoing a room at the same time as 100+ others. It gives me firm deadlines and stops me from procrastinating on design decisions. The pantry, garage, and master closet I’ve done for the One Room Challenge are by far my favorite rooms in the house. Even though this is a totally collaborative event with no winner, just putting the word “challenge” in front of me triggers something and I go ALL out. It consumes our life, I push myself to the point of wanting to quit, and then I dramatically swim in my tears to the finish line. And I love every minute of it. Except for all the times I hate it. But, mostly I love it. Let’s get the icky before photos of out the way so I can move past the shame and onto the plans that I’m SO EXCITED about. From the bedroom doorway, you can start to see why I called this the graveyard. The now-empty clothes rack we used when we were remodeling the closet is still in there. Under that, there’s a rolled up rug that used to be by the back door. Further in, we’ve got an old clothes hamper of things that need to be donated, the mirror from the closet-before, and the desk that used to be in the office. But wait, it gets worse! Once you get further in the room, you see Maddie’s crate, which also serves as a junk collector for my childhood rocking chair and yes, the orb I was making to use as the pantry fixture TWO YEARS AGO. The sweet little rocker had to be saved from a house full of active kiddos one day and I never took it back upstairs. Because why would I do that when it could live on top of a dog crate? Spinning to look at the bed wall, you can get a nice view of the patches between the ceiling and the wall. The builder sent someone to fix cracks, but never followed up with the painter. We finally gave up trying to get them to fix the spots because we knew we’d be painting everything, but the spots are so annoying to look at. There is one more piece of leftover furniture tucked in the far corner. We had a set of these slipper chairs from our old house, and they just aren’t the look we are going for in any room of this house. I sold one at a garage sale last year, and the other has just been squatting in the corner of the bedroom, which generally means stuff gets thrown on it. 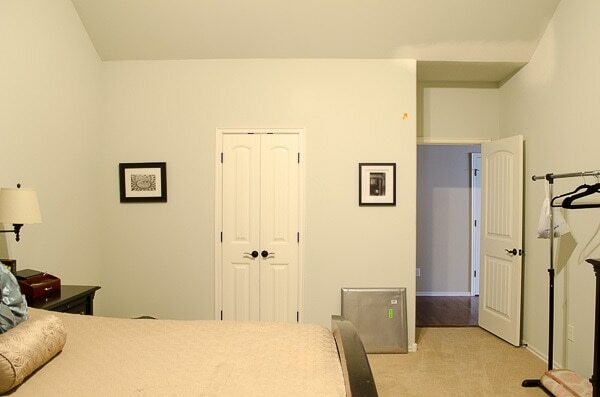 If we keep spinning around the room, the other side has some undersized art and more unpainted drywall patching. Oddly the smallest walls are the only ones with art. When the bathroom doors are open, the art doesn’t seem so oddly placed, but it could be bigger. One more spin and you can see the dresser wall. More of the same here. BIG wall, no art, more patches to stare at from the bed. Whew, I really can’t wait until I don’t live in those photos every day. 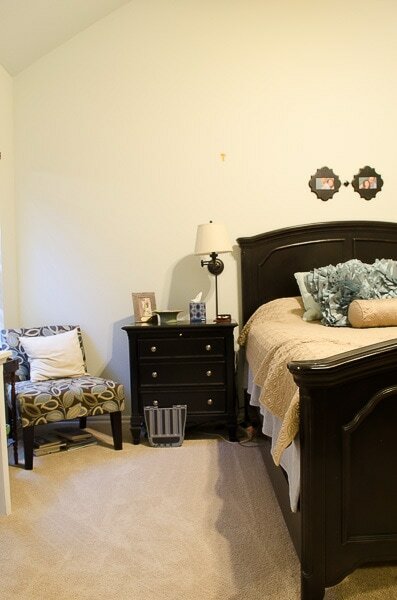 In addition to the clutter & drywall issues, I have some other problems with the master bedroom. 1. Not only is the space not OUR personality, it has no personality at all. None. BORING. 2. The walls are huge and bare. 3. The dresser, nightstands, and bed are all matchy-matchy and dark. My leg is constantly bruised from running into the footboard wings. Yes. I’ve had them for ten years and still can’t walk around them. 4. The blinds have horrible red undertones, and the windows are sad and naked. Send drapes ASAP. 5. The chair isn’t one I’d curl up and read in. 6. Have I mentioned the lack of personality??? As I started brainstorming about what I wanted the bedroom to look like, I thought about all the things I loved in the closet. The blend of light and dark, the glam accents, and the graphic art were all things I wanted to incorporate into our new room. BUT, I just wanted them to flow together, not to be matching spaces. 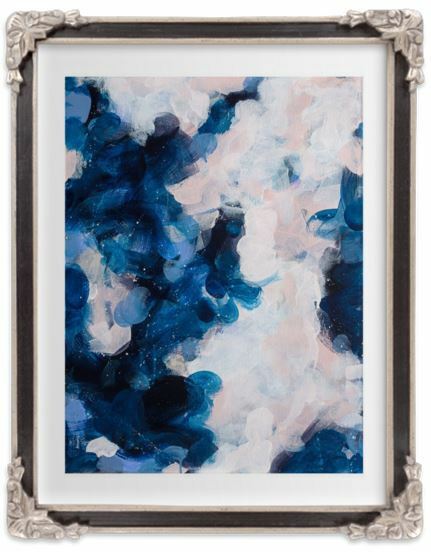 Browsing through Minted one day, I found the exact inspiration I needed! Here’s my vision for the bedroom in abstract art form. The blend of deep moody blues with bright whites and blushes makes my design-loving heart swoon. The art nods to both downtown and uptown, to glam and to modern, basically to all my split personality design loves. It made me wonder. Could I pull off a funky uptown meets downtown design? Okay, make the drumroll noise in your head now. Or out loud. Your choice! Here’s my design plan, looking in from the doorway. Just imagine the ceiling is still vaulted. Of all the amazing things I can figure out in my 3D rendering tool, I can’t get the ceilings right. But can you believe that is the same space? Spinning around to the bed wall, I’m switching out the dark wood bed for a winged and tufted beauty. I had NO idea how hard it was to find the PERFECT bed. It was definitely the hardest decision in the room. I’ve got an entire separate post brewing on all the things you need to consider before ordering a bed online. Hopefully someone will benefit from my hours of research! Did you notice the fun wall behind the bed? Just when I thought we retired from carpentry after the closet, we decided to do a fun wood wall treatment. Above the bed, my husband has schemed up a new art project. It may top the pantry pig! He’s got a plan, but we decided to keep it a secret until the reveal. For nightstands, I’ll be painting our existing pair a metallic silver color. They’ve got a great shape, and I’m hopeful they’ll have a whole new life in silver. The lamps in the pic above are just filler, with the real thing TBD. There might be a project involved, I’ve got an idea for something fun, but I don’t know if it will work yet. On the wall with the doors, I think I’m going to be using some vintage art prints of two of my favorite buildings in Tulsa. I own the prints already, so in addition to loving them, it will be a budget saver. The final wall is going to have more exciting art! Those gorgeous prints on the sides are by the talented Leigh Viner. I bought one of her prints for the closet and love it so much. I had to have more! 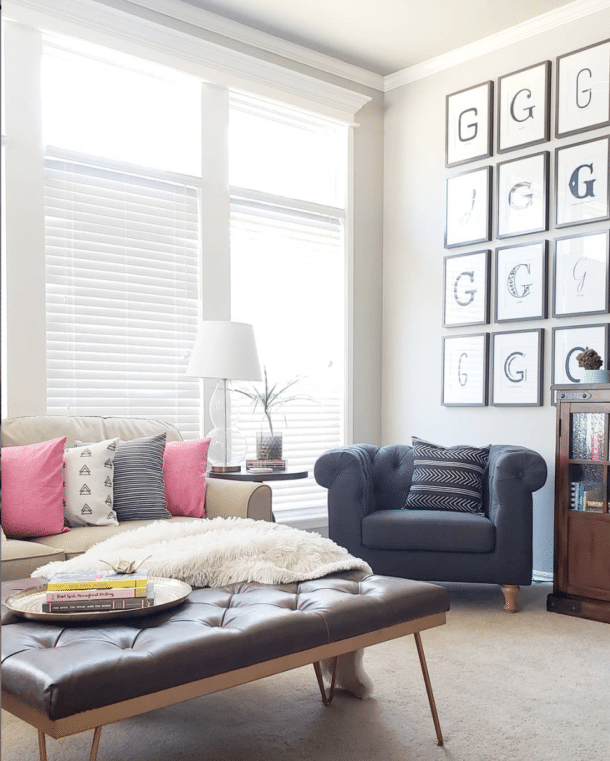 They are 30″ x 40″ and will do wonders on that tall wall. I’m also painting the dresser silver, which should look way better in real life than the sample dresser above. The mirror currently attached to the dresser is getting ditched, and we’re adding a wall mounted TV instead. The tentative plan between the art prints is to add black and white photography, but that may change. I want to get the big pieces in place and then ponder. So that’s the broad plan! There will be more details added, and I’m sure some changes will be made as we go. I’m SO glad it’s finally time to start implementing all these plans I’ve been working on. It makes me totally nervous that I’m traveling twice during this five week challenge, including a 5 day trip starting next Wednesday. Hopefully, we’ll put a dent in the to do list before I go! Make sure you’re following along on Instagram for behind the scenes updates. Friday, the paint samples will go up and I’m sure I’ll post the options for feedback! I plan to paint samples Friday morning, then go back to buy oodles of paint Friday night. Yikes, fast decision time! Now that you’ve seen the plans, make sure you check out all the other spaces over at Calling It Home. It’s always fun to look through all the before photos! And if you’re visiting from Calling It Home, welcome! I’d love you to check out my prior ORC spaces before you go. 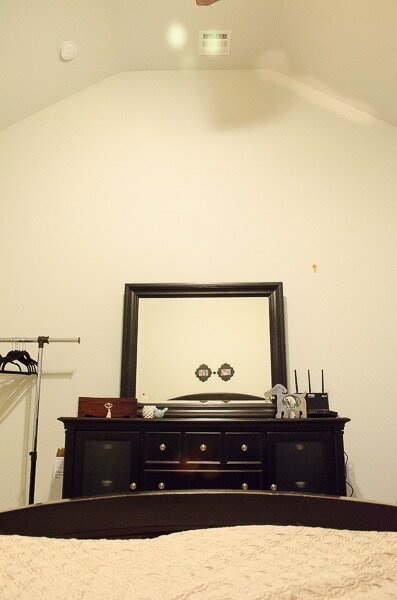 Hi Melissa, I love all of your ORCs and can’t wait to follow along as you transform this room! Love your ideas. Can’t wait to see how this room comes together each week. Have a great day! This is going to be fantastic. Good luck! especially with all the travel! Bah I can’t wait! This is going to be so fab! The color scheme has me all heart eyed 🙂 Good luck and so excited to follow along! Thanks Jodie! I just want to snap my fingers and have it done so I can see if the plans work! Hey Melissa – We love your design plans and your color palette! We too are curious about the art project! Cheers to smooth sailing for the next five weeks! Thanks so much ladies! Fingers crossed the color palette and art project work as well in real life as they do in our head! Oh wow! I have been following your blog for a while although I may not always leave a comment! I love what you do and those transformations are really something (in a positive way)! No wonder you’ve been featured all over the place:) That garage – I still cannot tell that it is a garage – never seen anything like it! 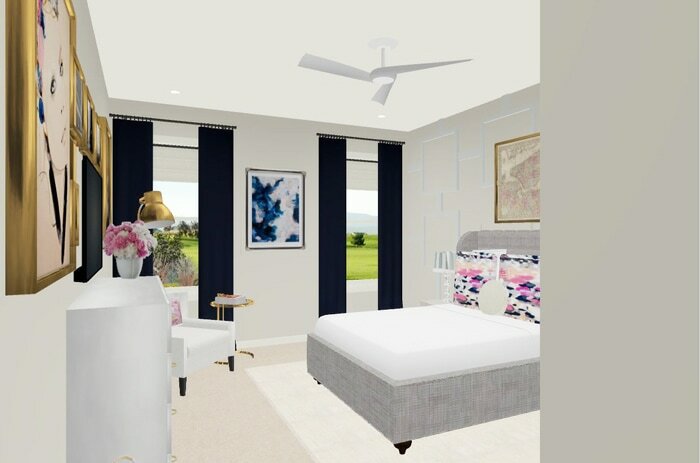 Your master bedroom will look just as fabulous! That secret wall project is going to be awesome, too!!!! We are also transforming our furniture graveyard, but into a nursery!! 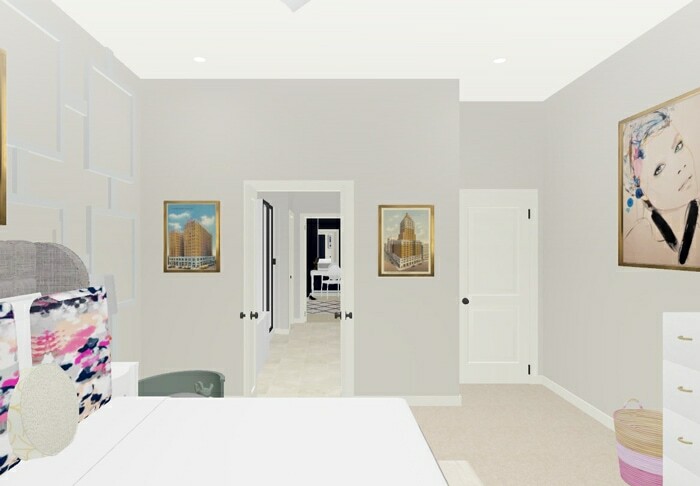 I can’t wait to see your finished space! So glad I’m not the only one to gave a furniture graveyard! Can’t wait to see your nursery come together! It’s so comforting to know a design GENIUS such as yourself is also living in a boring bedroom! I’ve also prioritized our main areas of the house before our bedroom, and feel so sad every time I walk into our room. Inspired to look at it with fresh eyes! What a sweet thing to say Sandi! As I stare at 10 paint samples, on the wall I don’t feel like a genius, so I appreciate the confidence boost! So glad you’re inspired to see your own bedroom with fresh eyes. Thanks again! Oh, melissa, glad to see I;m not the only one with a master bedroom of furniture and item misfits! This is going to turn out fabulous. Best of luck! Hey! I’m a first time visitor to your site. I just started blogging 2 months ago and decided to try the ORC. 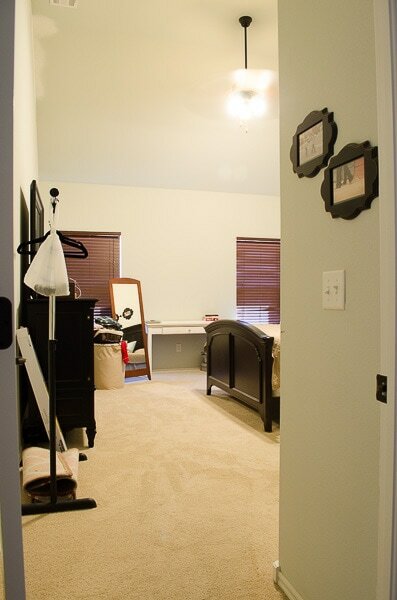 We’ll be working on transforming our “office” into a mudroom, but we also have a master bedroom much like yours! We recently purchased a killer bed, but now we are waiting to see what will inspire the rest of the room. I will definitely follow your orc! 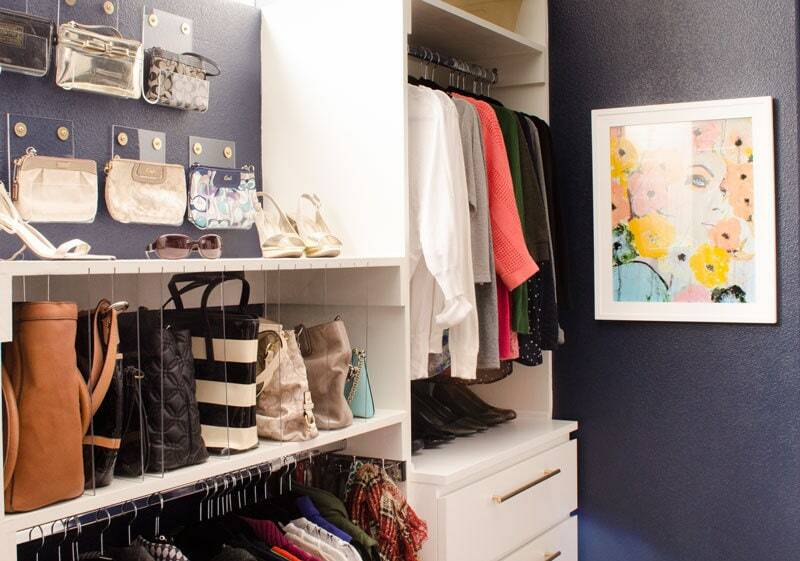 I LOVE the purse display in your closet, by the way! I might have been a bit obssesed with the planning. Can’t wait to see your living room! girl, we have the same taste in art….I CANNOT wait for your reveal!!!!!!! Thanks Jess! I’m so excited to finally have some appropriately sized art in the house! “I love it, except for when I hate it” had me laughing out loud. I can not wait to see this. The plan is fantastic. You are lucky your husband is handy. 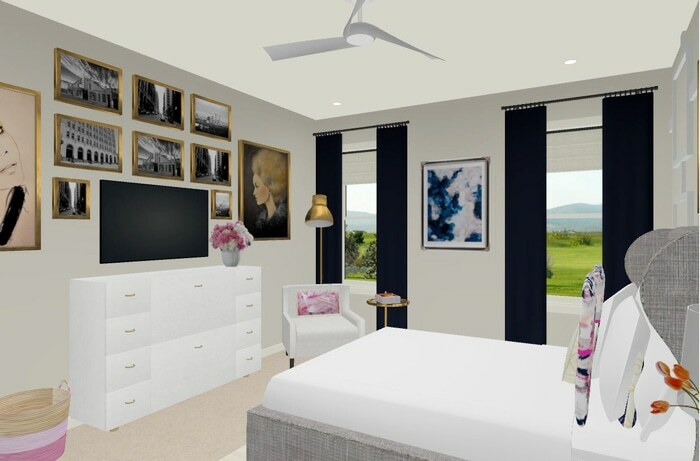 Melissa, your rendering is incredible! I feel like I’m watching a fancy design show like Fixer Upper 😉 I know you’re going to blow this makeover out of the water, and I can’t wait to follow along week-by-week. And I’m so curious about the treatments are art you have planned for your walls because my husband and I have a vaulted ceiling in our master and I am a little stumped about how to treat the tallest wall. It needs something substantial, but I haven’t found an idea I love yet. 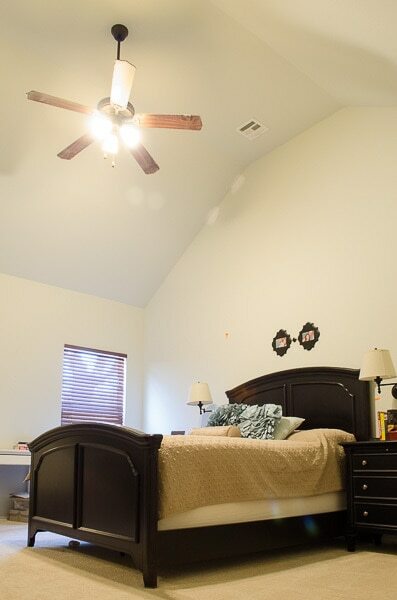 Golly, your bedroom is huge and the tall ceilings are amazing! Love the deep blues and purples in the inspiration room. I never get tired of that combo! Can’t wait to see the reveal and the secret art project. GIRL. That’s EXACTLY how I feel about our MBR right now. Cheers to ORC makeovers!!! 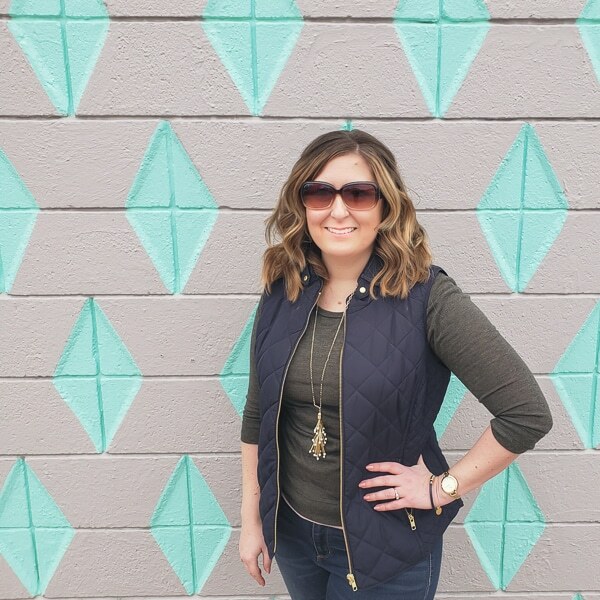 Loving your style and your design inspo….the 3d is so Joanna Gaines of you. I’m super impressed! 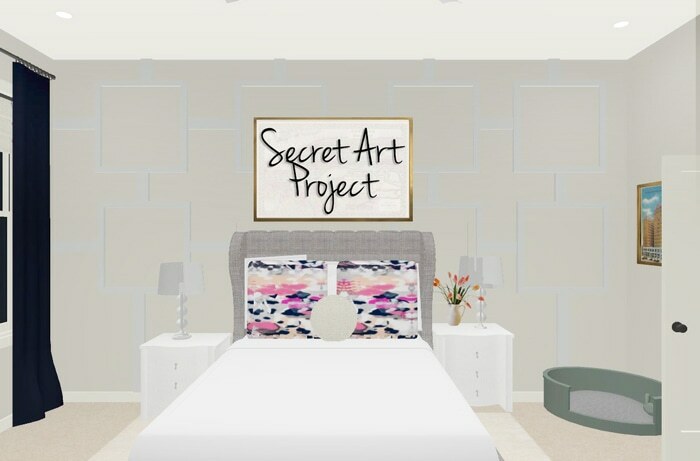 Cannot wait to see the secret art project! This is going to be major!! Love your design board and you’re previous ORC’s are amazing! Can’t wait to see this one. I’m totally nervous but SO excited to tackle my first ORC! Off to find you on IG! Wow at that ceiling, love it!